A prop is any object used by actors or as set decoration on a film. 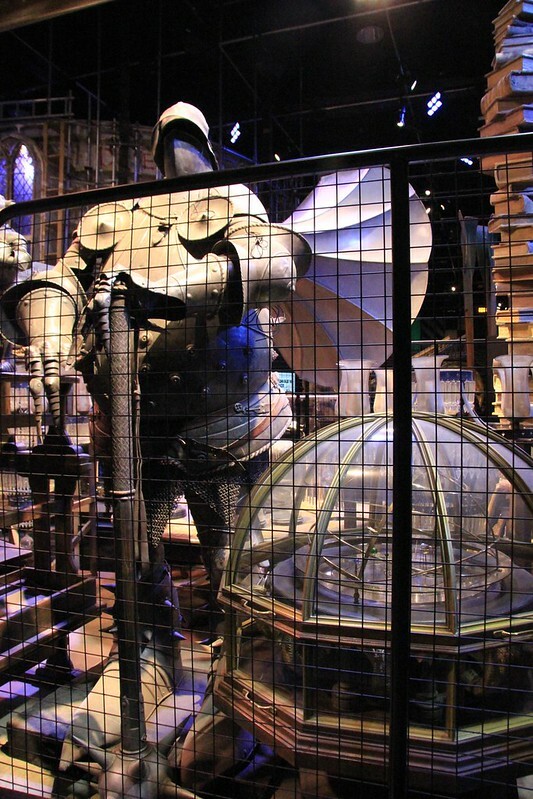 By the time production ended in 2011, the Harry Potter Prop Department had filled five large warehouses with thousands of items (made specifically for the films or purchased from a variety of specialty shops) including 5,000 pieces of furniture, 12,000 handmade books and 40,000 Weasley’s Wizard Wheezes products and packages. People the world-over have been enchanted by the Harry Potter films for nearly a decade. The wonderful special effects and amazing creatures have made this iconic series beloved to both young and old – and now, for the first time, the doors are going to be opened for everyone at the studio where it first began. You’ll have the chance to go behind-the-scenes and see many things the camera never showed. From breathtakingly detailed sets to stunning costumes, props and animatronics, Warner Bros. Studio Tour London provides a unique showcase of the extraordinary British artistry, technology and talent that went into making the most successful film series of all time. Secrets will be revealed. Warner Bros. Studio Tour London provides an amazing new opportunity to explore the magic of the Harry Potter films – the most successful film series of all time. This unique walking tour takes you behind-the-scenes and showcases a huge array of beautiful sets, costumes and props. It also reveals some closely guarded secrets, including facts about the special effects and animatronics that made these films so hugely popular all over the world. – Step inside and discover the actual Great Hall. – Explore Dumbledore’s office and discover never-before-seen treasures. – Step onto the famous cobbles of Diagon Alley, featuring the shop fronts of Ollivanders wand shop, Flourish and Blotts, the Weasleys’ Wizard Wheezes, Gringotts Wizarding Bank and Eeylops Owl Emporium. – See iconic props from the films, including Harry’s Nimbus 2000 and Hagrid’s motorcycle. – Learn how creatures were brought to life with green screen effects, animatronics and life-sized models. – Rediscover other memorable sets from the film series, including the Gryffindor common room, the boys’ dormitory, Hagrid’s hut, Potion’s classroom and Professor Umbridge’s office at the Ministry of Magic. Located just 20 miles from the heart of London at Warner Bros. Studios Leavesden, the very place where it all began and where all eight of the Harry Potter films were brought to life. The Studio Tour is accessible to everyone and promises to be a truly memorable experience – whether you’re an avid Harry Potter fan, an all-round movie buff or you just want to try something that’s a little bit different. The tour is estimated to take approximately three hours (I was in there for 5 hours! ), however, as the tour is mostly self guided, you are free to explore the attraction at your own pace. During this time you will be able to see many of the best-loved sets and exhibits from the films. Unique and precious items from the films will also be on display, alongside some exciting hands-on interactive exhibits that will make you feel like you’re actually there. The magic also continues in the Gift Shop, which is full of exciting souvenirs and official merchandise, designed to create an everlasting memory of your day at Warner Bros. Studio Tour London. Hogwarts Castle Model – Get a 360 degree view of the incredible, hand sculpted 1:24 scale construction that features within the Studio Tour. The Hogwarts castle model is the jewel of the Art Department having been built for the first film, Harry Potter and the Philosopher’s Stone. It took 86 artists and crew members to construct the first version which was then rebuilt and altered many times over for the next seven films. The work was so extensive that if one was to add all the man hours that have gone into building and reworking the model, it would come to over 74 years. The model was used for aerial photography, and was digitally scanned for CGI scenes. The model, which sits at nearly 50 feet in diameter, has over 2,500 fibre optic lights that simulate lanterns and torches and even gave the illusion of students passing through hallways in the films. To show off the lighting to full effect a day-to-night cycle will take place every four minutes so you can experience its full beauty. An amazing amount of detail went into the making of the model: all the doors are hinged, real plants are used for landscaping and miniature birds are housed in the Owlery. To make the model appear even more realistic, artists rebuilt miniature versions of the courtyards from Alnwick Castle and Durham Cathedral, where scenes from Harry Potter and the Philosopher’s Stone were shot. Image published by Karen Roe on 2012-06-15 19:19:30 and used under Creative Commons license.